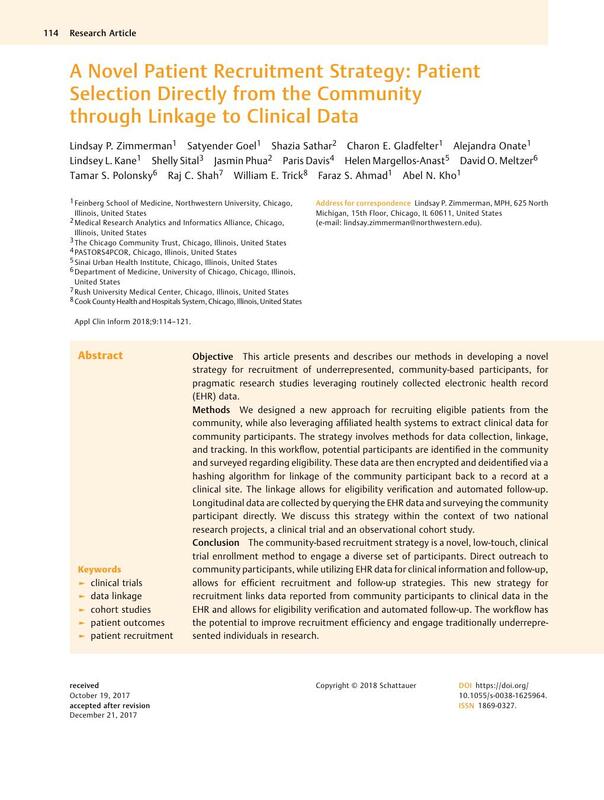 Objective This article presents and describes our methods in developing a novel strategy for recruitment of underrepresented, community-based participants, for pragmatic research studies leveraging routinely collected electronic health record (EHR) data. Methods We designed a new approach for recruiting eligible patients from the community, while also leveraging affiliated health systems to extract clinical data for community participants. The strategy involves methods for data collection, linkage, and tracking. In this workflow, potential participants are identified in the community and surveyed regarding eligibility. These data are then encrypted and deidentified via a hashing algorithm for linkage of the community participant back to a record at a clinical site. The linkage allows for eligibility verification and automated follow-up. Longitudinal data are collected by querying the EHR data and surveying the community participant directly. We discuss this strategy within the context of two national research projects, a clinical trial and an observational cohort study. Conclusion The community-based recruitment strategy is a novel, low-touch, clinical trial enrollment method to engage a diverse set of participants. Direct outreach to community participants, while utilizing EHR data for clinical information and follow-up, allows for efficient recruitment and follow-up strategies. This new strategy for recruitment links data reported from community participants to clinical data in the EHR and allows for eligibility verification and automated follow-up. The workflow has the potential to improve recruitment efficiency and engage traditionally underrepresented individuals in research. This study is presenting an alternative design of cohort-based trails with no actual human subject involvement. The case study cited in the design was approved under CAPriCORN's own institutional review board (IRB) of record “CHAIRb” and a study protocol of PCORI-funded ADAPTABLE, and NSF-funded “All of Us” protocols.